Note: There will be a $10 charge for Judo BC Members who want this registered as an NCCP Points Clinic. After graduating from Tenri University (Japan), Sensei Hiroshi Katanishi, 8th dan, became trainer of France’s National Judo team. Katanishi sensei has been instructor for the past 30 years of the Judo Kwai Lausanne in Switzerland. Katanishi sensei is also a Dan expert, Youth & Sports Expert for the Switzerland Judo Federation. Since 1999, he has been the technical advisor to the Swiss National Team. In 2003, he became the European Union judo expert. 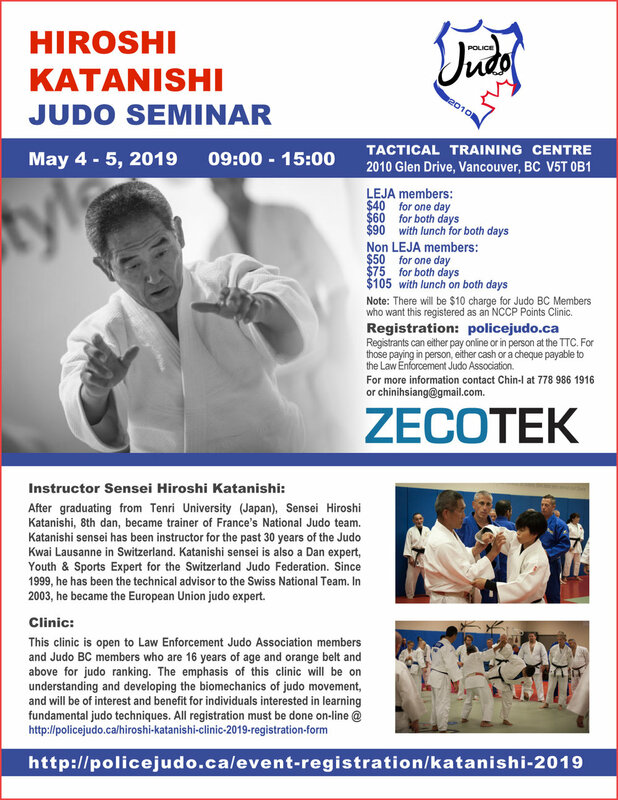 This clinic is open to Law Enforcement Judo Association members and Judo BC members who are 16 years of age and orange belt and above for judo ranking. The emphasis of this clinic will be on understanding and developing the biomechanics of judo movement, and will be of interest and benefit for individuals interested in learning fundamental judo techniques. All registration must be done on-line. Police Judo is a non-profit association and is a judo-based functional fitness training program designed to develop physical strength and conditioning. Police Judo is committed to teaching appropriate techniques for law enforcement and to provide self defence skills for students. Copyright © Law Enforcemenr Judo Association. All rights reserved. Website maintained by Gonca Jane Denizmen.